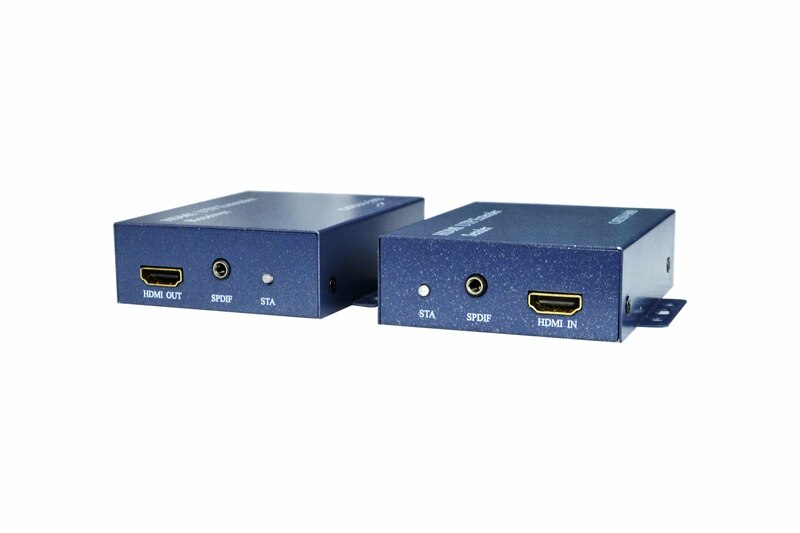 These HDMI splitters and transmitters are useful to transport the HDMI video output of DVR/NVR to the monitor. 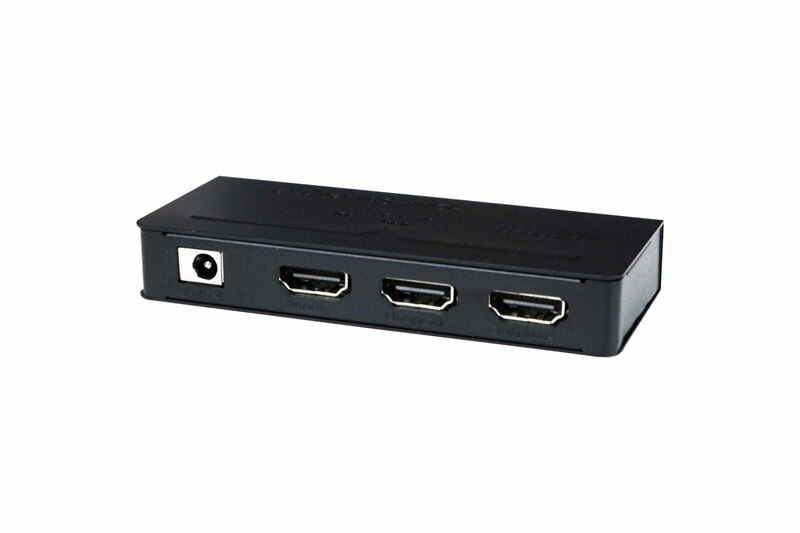 HDMI splitter with 1 input port and 2 output ports. 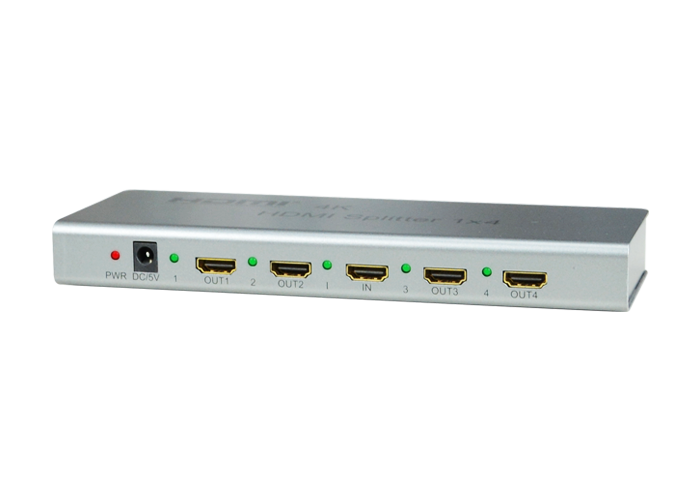 HDMI splitter with 1 input port and 4 output ports. Supporting 4K resolution. 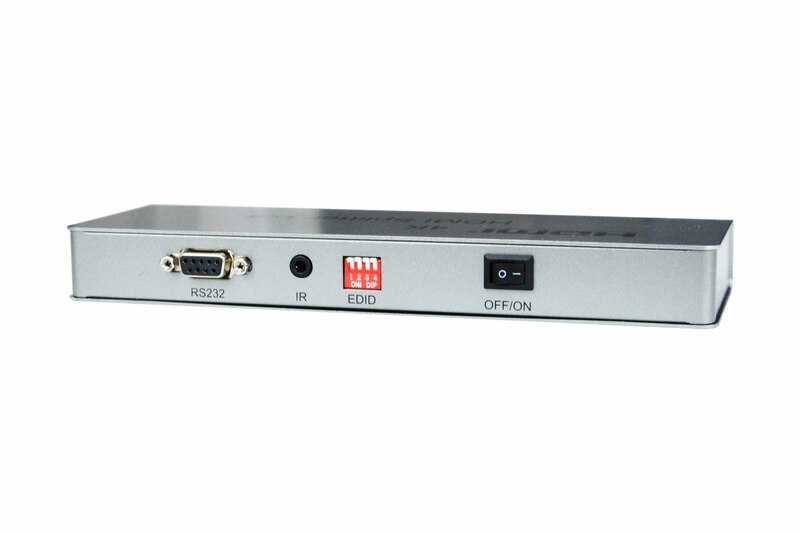 HDMI transmitter over 1 UTP (100m.). With splitter. 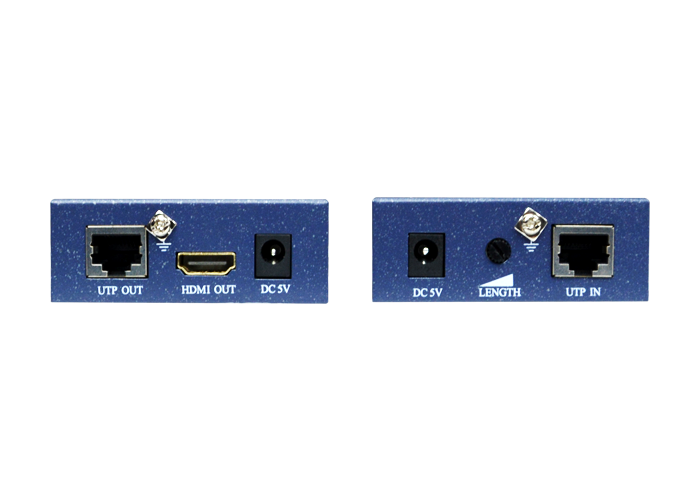 IP HDMI transmitter over UTP cable (120m.) or over TCP/IP LAN network. 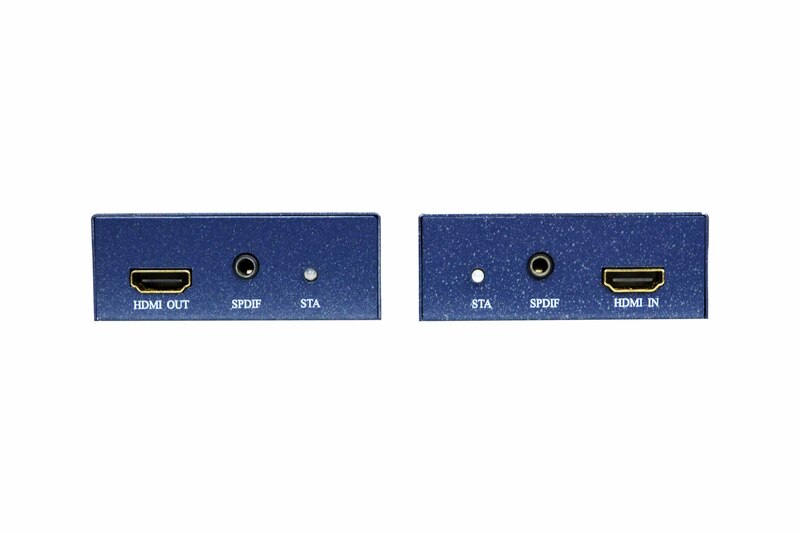 This accessory allows you to split an input HDMI signal into 2 identical output signals. 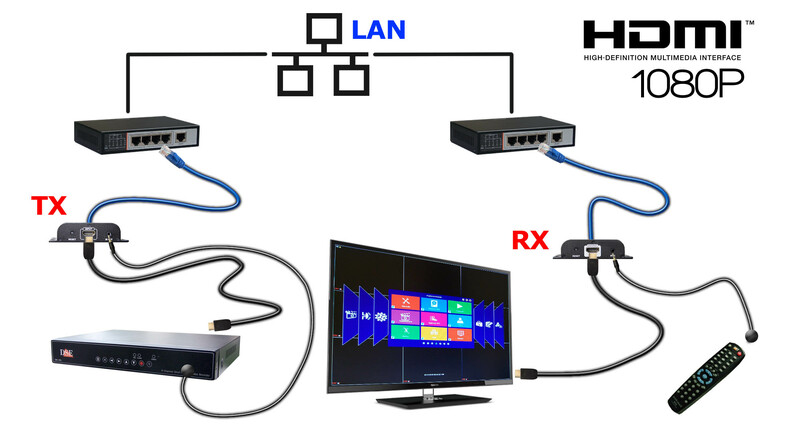 It is useful, for example, for the connection of two TV monitors to a single DVR / NVR. 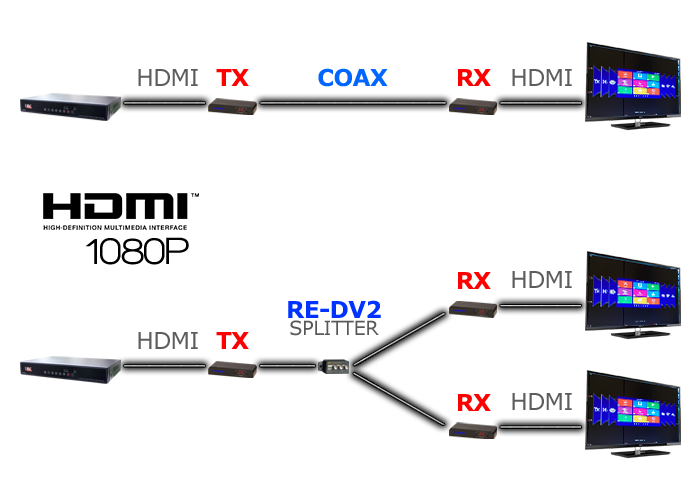 You can connect several splitters in sequence to further split the signal into a greater number of identical subsignals. 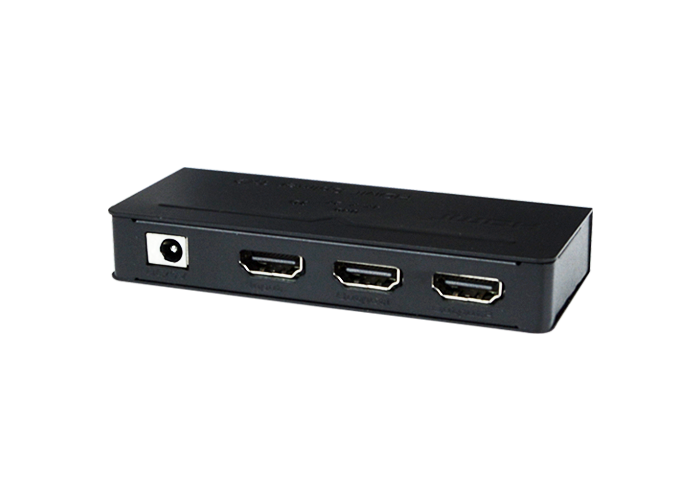 This accessory allows you to split an input HDMI signal into 4 identical output signals. 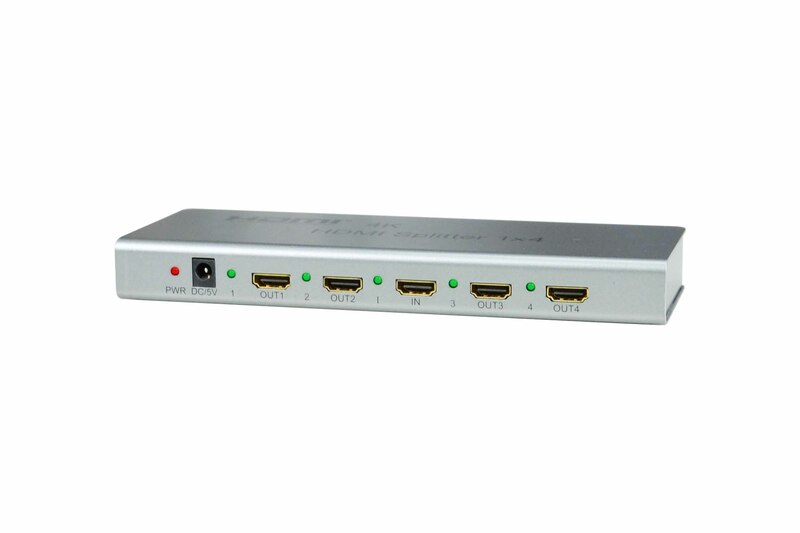 It is useful, for example, for the connection of several TV monitors to a single DVR / NVR. You can install more than one splitter in sequence to further split the signal into a greater number of identical subsignals. This splitter supports the 4K resolution and you can use it with our best 4K DVRs / NVRs to connect 4K monitors. 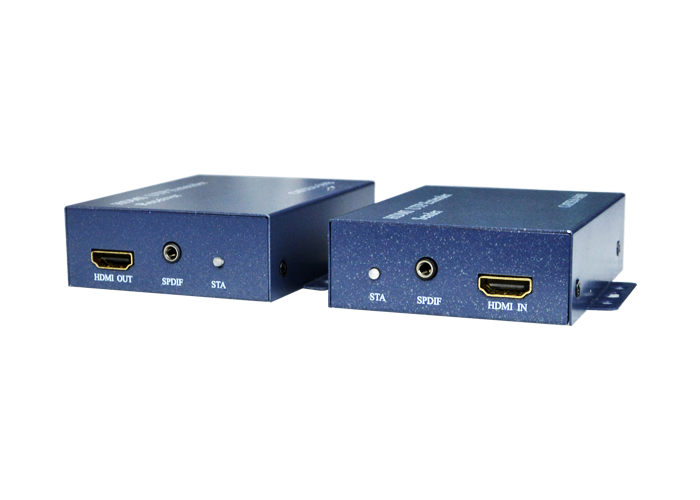 The HDMI signal is very sensitive and it is possible to transport it thorugh a cable only for a few meters. 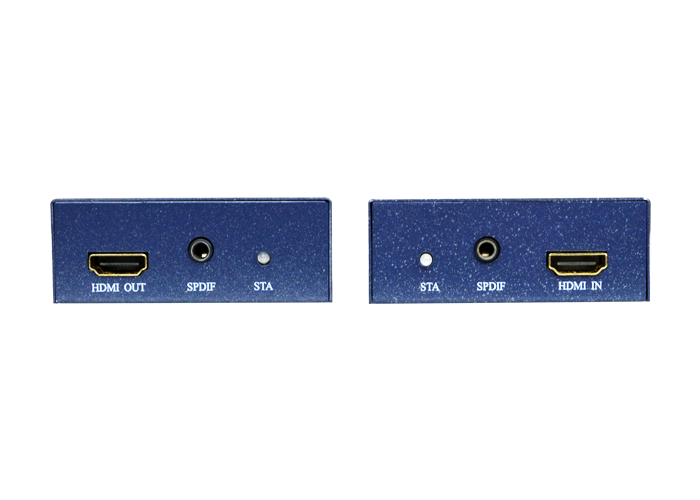 If you use special cables, like our high-performance HDMI cables ), you can reach 20 m. but these cables are expensive and hard-to-handle. 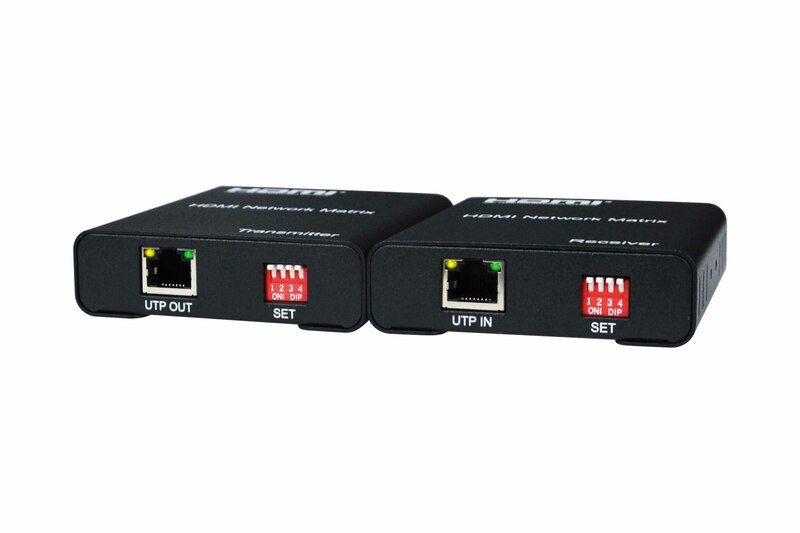 These transmitters allow you to transport the HDMI signal up to a maximum distance of 50 m using two UTP CAT5 / 6 network cables. 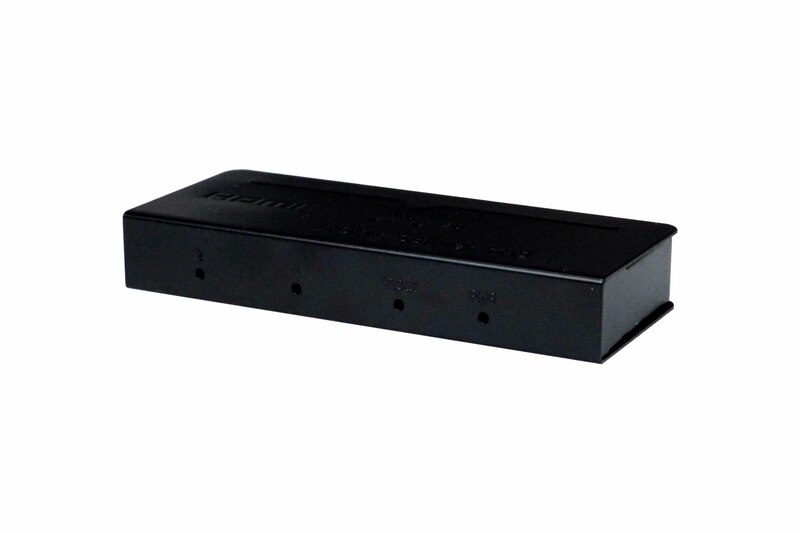 The product consists of a transmitter, that you can connect to the video source (DVR / NVR) and a receiver that you can connect the TV set. The system supports both video and audio. Only the transmitting unit needs power supply. 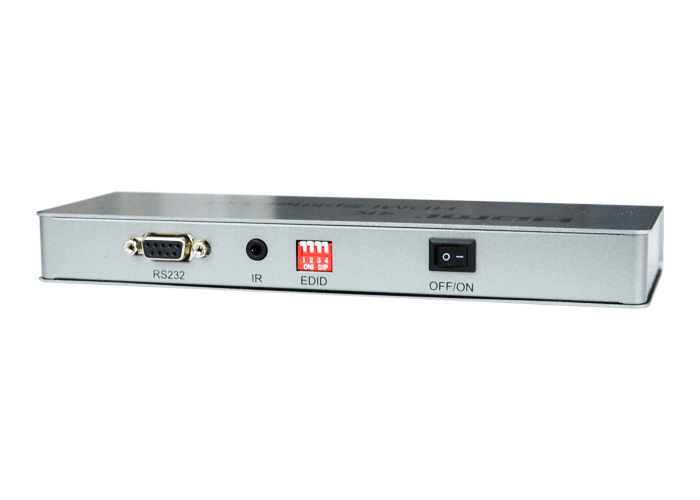 The receiver is powered by the network cables. 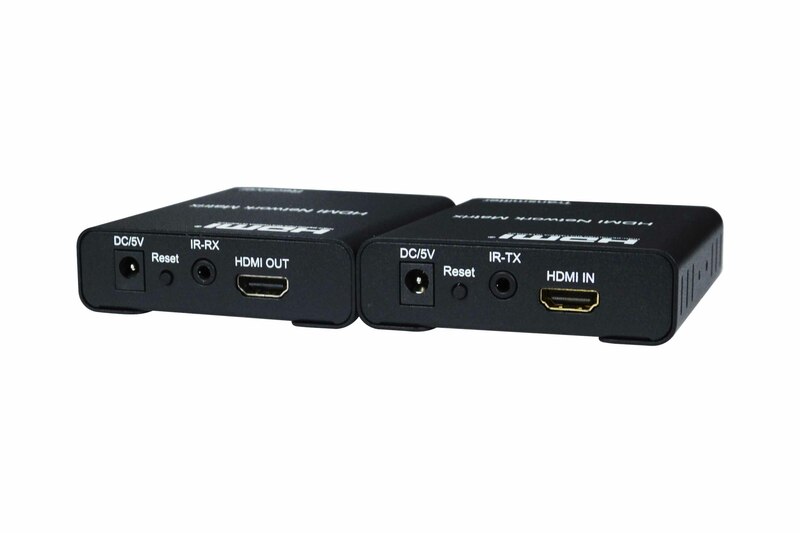 This HDMI transmitter is different from other similar devices in this range. 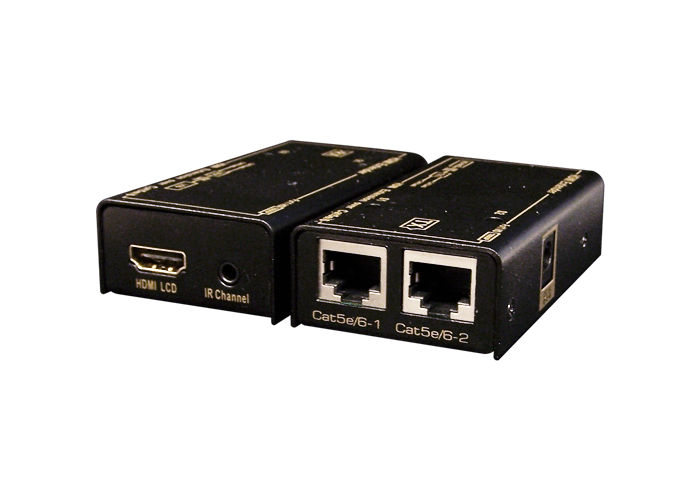 It can work in two ways: as a simple HDMI transmitter on a UTP cable or as an HDMI transmitter on a TCP / IP network. 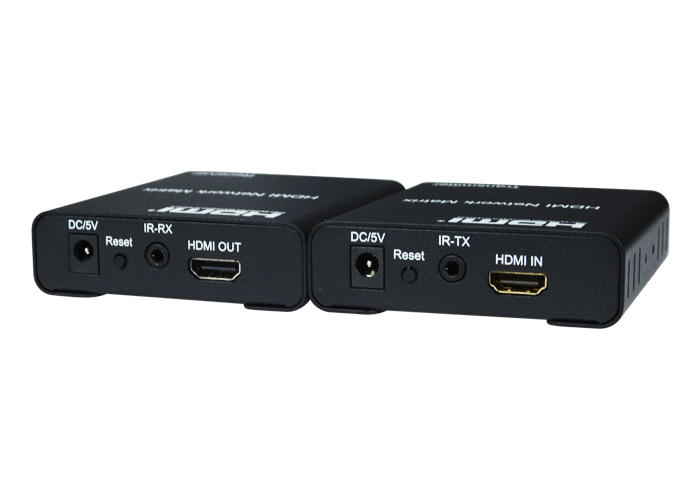 If you use it as the first option, you can carry the HDMI signal to a maximum distance of 120m. 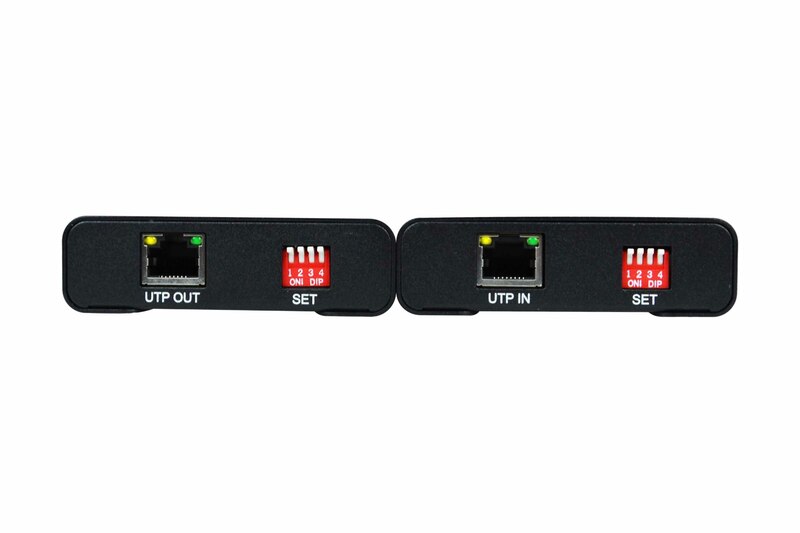 on a single UTP CAT5 / 6 network cable . 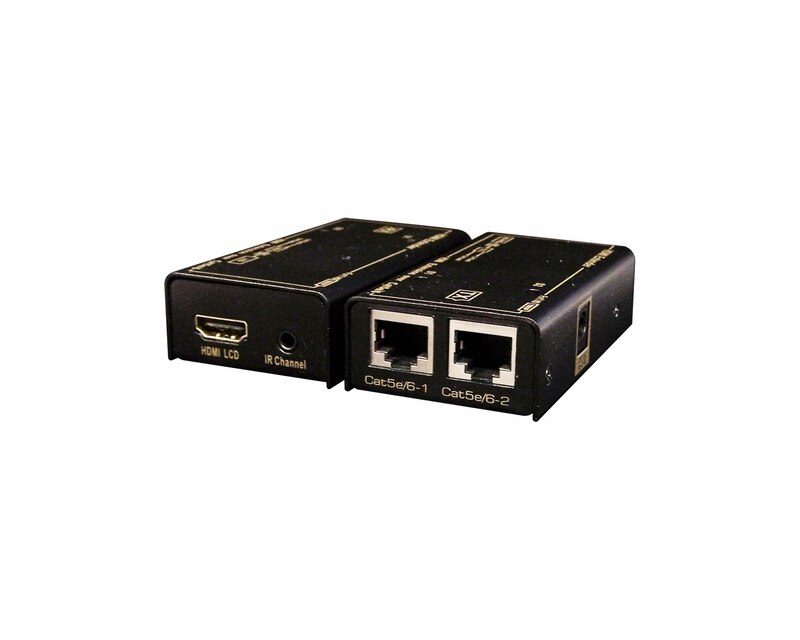 You can also use this transmitter to carry the HDMI signal over your Ethernet network. 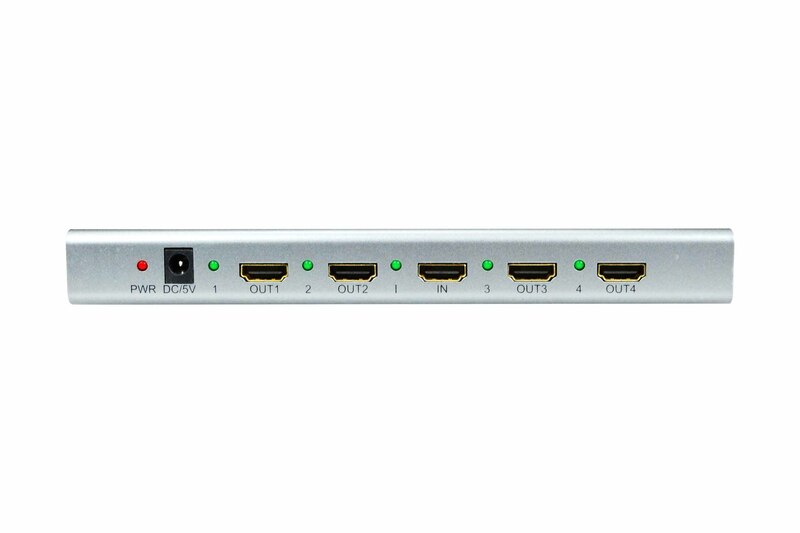 This is a very interesting feature that allows you to save a lot of cabling and place the monitor wherever you like within your network, just like a computer. 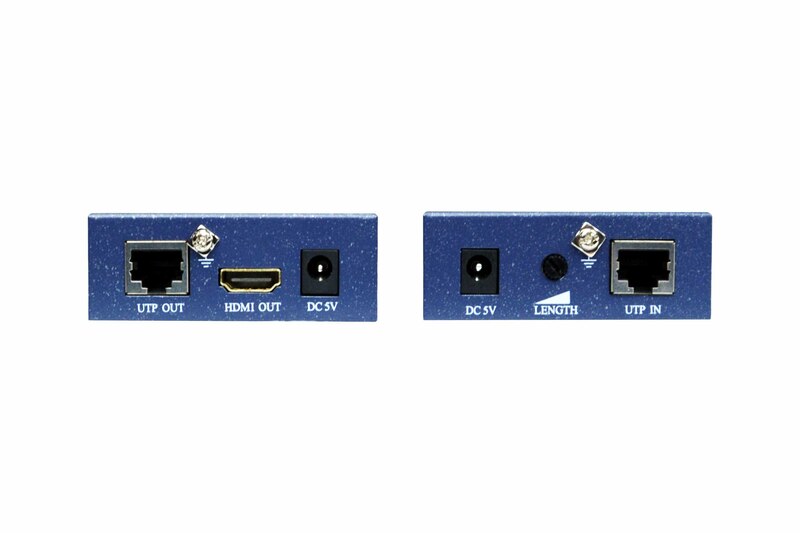 To use this HDMI transmitter on your network, you just need to connect the transmitter and the receiver to your LAN and they will connect to each other automatically. 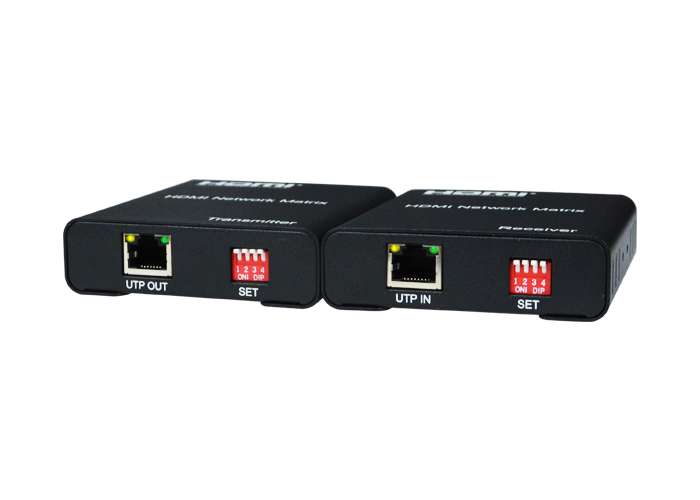 You will not have to set IP addresses or any other network parameters. 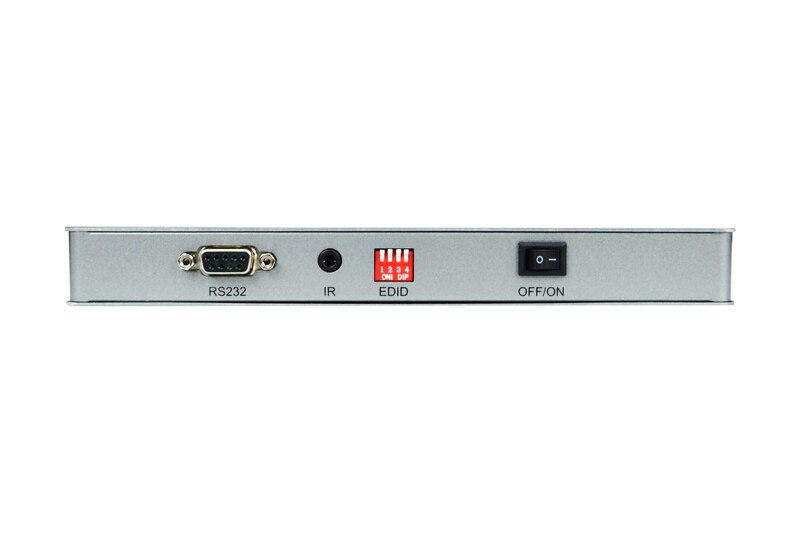 Both the transmitter and the receiver have 4 addressing microswitches, very useful if you want to install many transmitters and receivers on the same network. You can connect up to 16 pairs of independent transmitters on the same network, or you can install a single transmitter connected to many receiver units that will replicate the same video signal on multiple monitors. 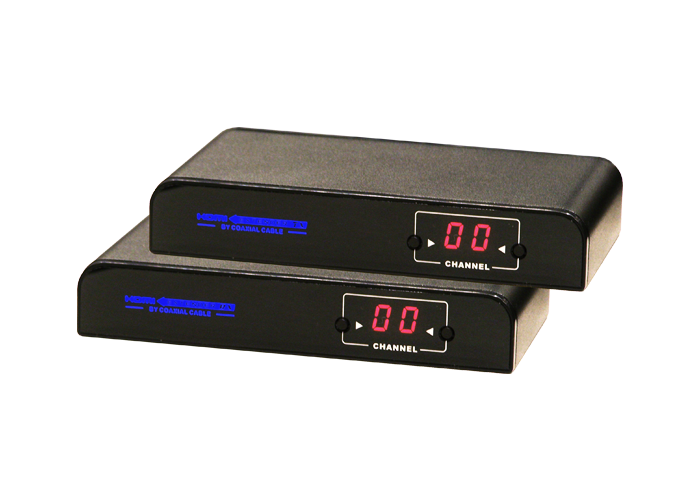 Both the transmitter and the receiver must be powered with the included 5VDC power adapters. 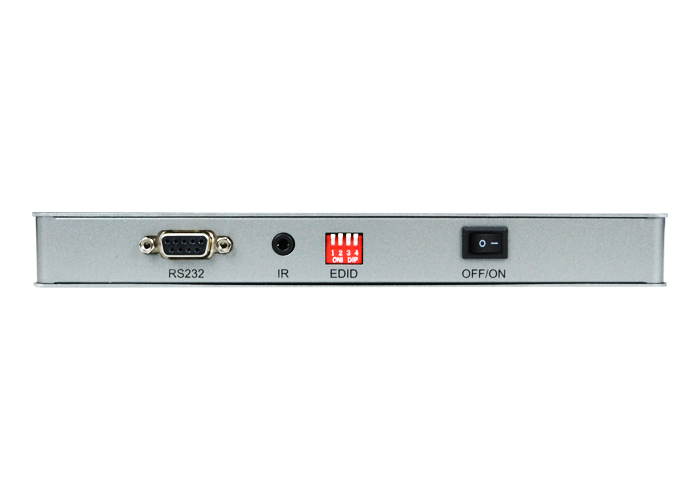 The system transmits both video and audio signals and also an IR signal for IR remote control (IR receivers included). 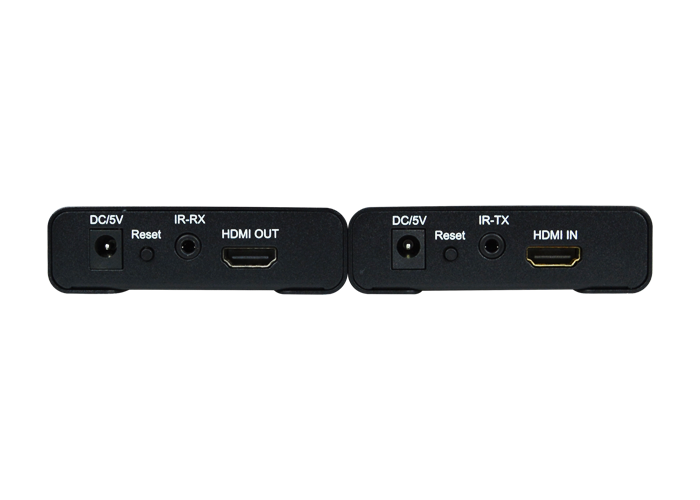 This unit, like other ones in this range, transports the HDMI signal from the DVR / NVR to the monitor. 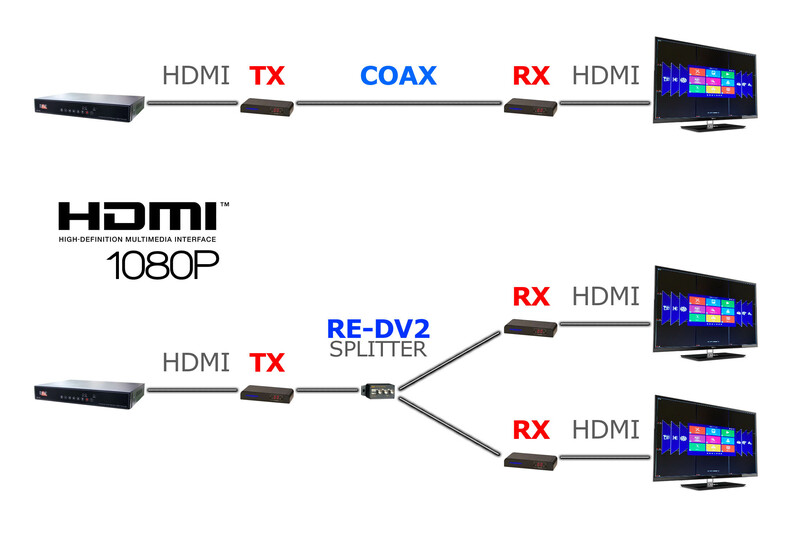 Unlike other models, however, RE-HDMI-RG supports common coaxial cables, quite common in analogue CCTV. This transmitter supports any type of 75 OHM coaxial cable : from the classic RG59, to the mini-coaxials like RG179, up to special cables like RG6 or RG11. 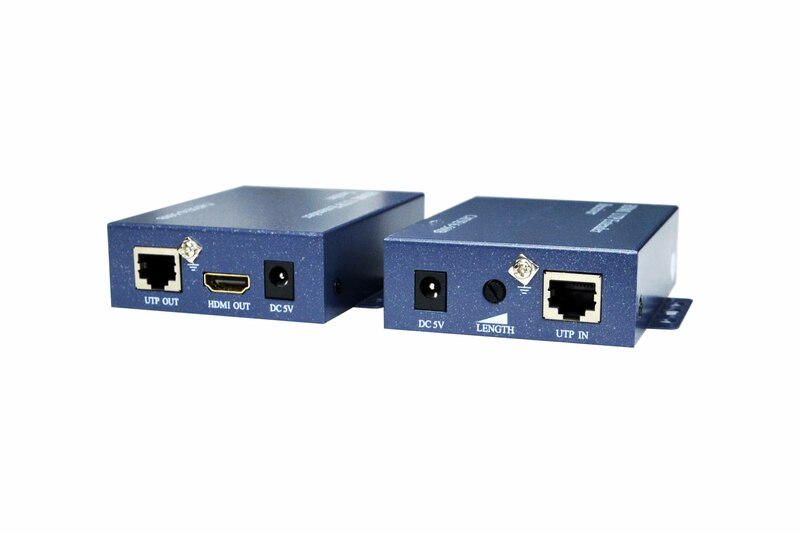 It is ideal if you want to use the already-existing wiring of an old CCTV system, where the monitor signal was CVBS video carried on coaxial cables. An interesting feature of this transmission system is the possibility to insert video distributors (Splitter) along the coaxial cable. 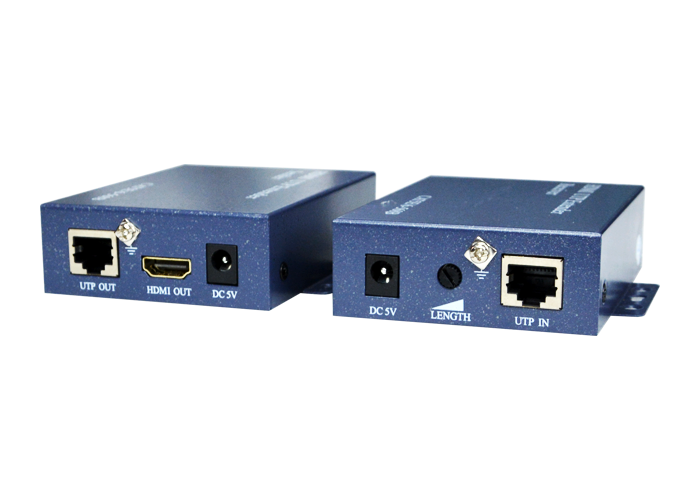 Splitters are fully supported and allow you to carry the HDMI signal of one DVR to many monitors, using one transmitter and multiple receivers. 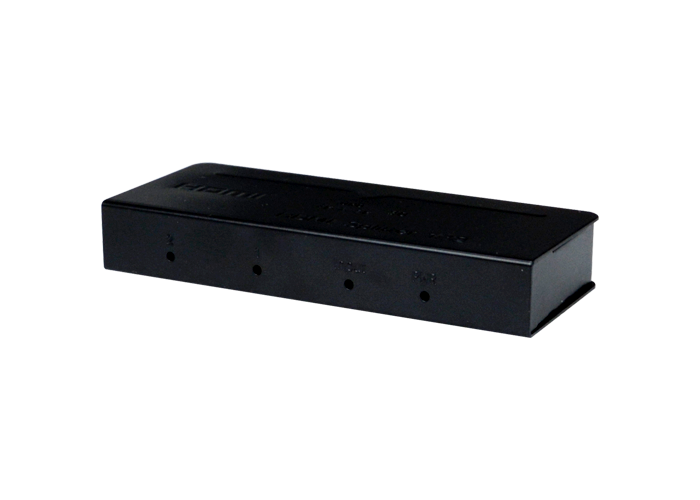 The product consists of a transmitter, that you can connect to the video source (DVR / NVR) and a receiver that you can connect the TV or monitor. Both elements must be powered at 5VDC with the power supplies supplied. 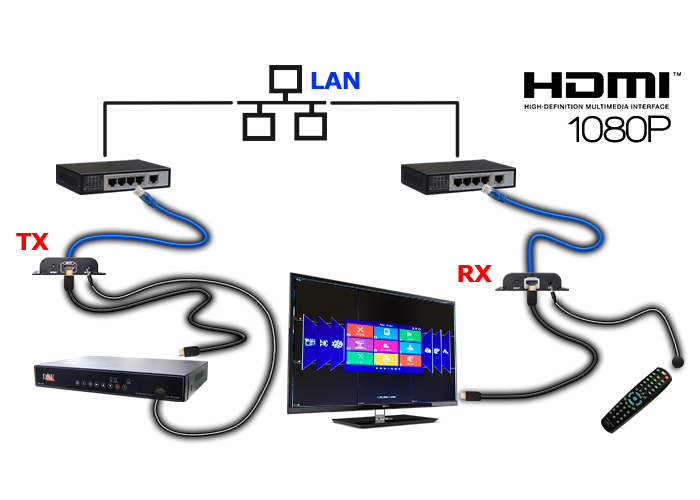 The system transmits both video and audio. The maximum length of the coaxial cable depends on the type of cable used, but it is normally well over 500 m. Transmitter and receiver are equipped with a transmission frequency selector to best adapt to the length of the cable. 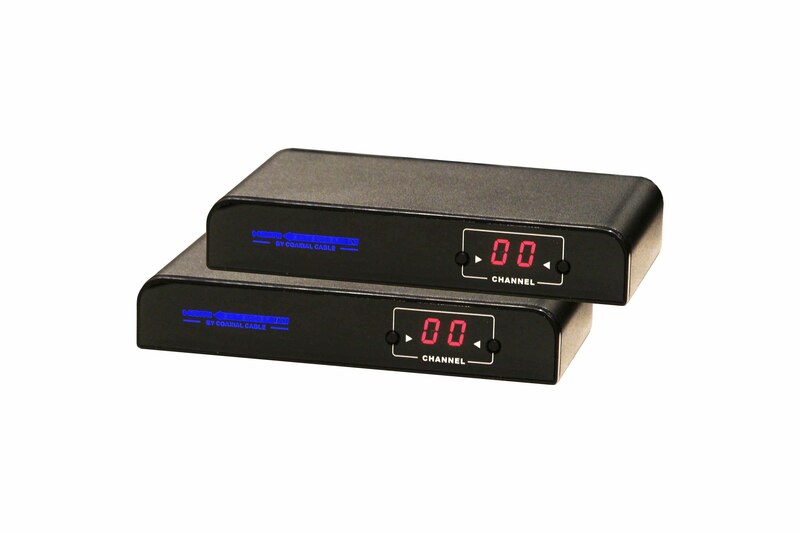 The receiver has a yellow LED that indicates when the connection with the transmitter is correctly established. Pin 5.5x2.1 mm. Pin 5.5x2.1 mm. Pin 5.5x2.1 mm. Pin 5.5x2.1 mm. Pin 5.5x2.1 mm. Pin 5.5x2.1 mm.